Previously I wrote about the death of our Thunder cat. It was sad but it created an opportunity for a new home for other cats. 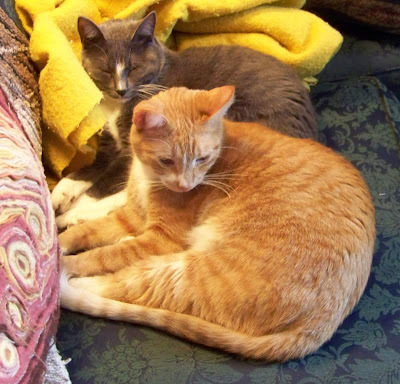 The day after we got back, Don check the classified ads online and found two cats needing a home just down the street. A young couple just had a baby and realized they couldn't afford a baby and two cats. She wanted them adopted together, the male cat was very shy and adjusted very poorly to change; having his companion would help him. The problem was that potential adopters wanted the personable young female and rejected the shy male. We wanted two cats that got along together and understand the need for patience in having a cat adjust to a new home. Along with the cats we got two large ceramic food bowls, cat food, cat litter, a carrier and a cat toy. The cats had been neutered, the male was declawed, and current on their shots. As soon as they were released from their carriers, they went and hid in separate areas of the house. After only a few hours the young gray & white female, Lily, came out and made friends with me. It was days when the yellow & white male, Louie, was seen. We knew he moved about the house while we where sleeping. After 3 days of not seeing him, we had to take action in getting Louie to accept us. I bought a kennel, set it up in the studio with a litter pan, food and water. I also set in a sleeping shelf. Then we cornered Louie in the bedroom and nabbed him. He hated that and struggled. I still bear the marks. Into the kennel he went. I spend most of my day in the studio. He became accustomed to me and let me pet him through the cage. Eventually I would let him out in just the studio and put him back in when I left the room. After about three days of this he was comfortable with me, though not with Don. The kennel saw further use when the female cat was declawed and she was kept in there to restrict movement while convalescing. We decided the names Louie and Lily sounded too much alike so Lily became Millie and Louie was shortened to Lou. Though sometimes I call him Louper (Lou + leaper) since in playing chase the string he would take great leaps into the air or Lanky Lou since he had proportionaly longer legs and tail than Millie. Lou, once he trusted, is an affectionate, cuddly cat. I could on further about these cats, maybe in another post! I did two more oil pastels after coming home. Then it was time to put them away and do leaf drawings in colored pencil. 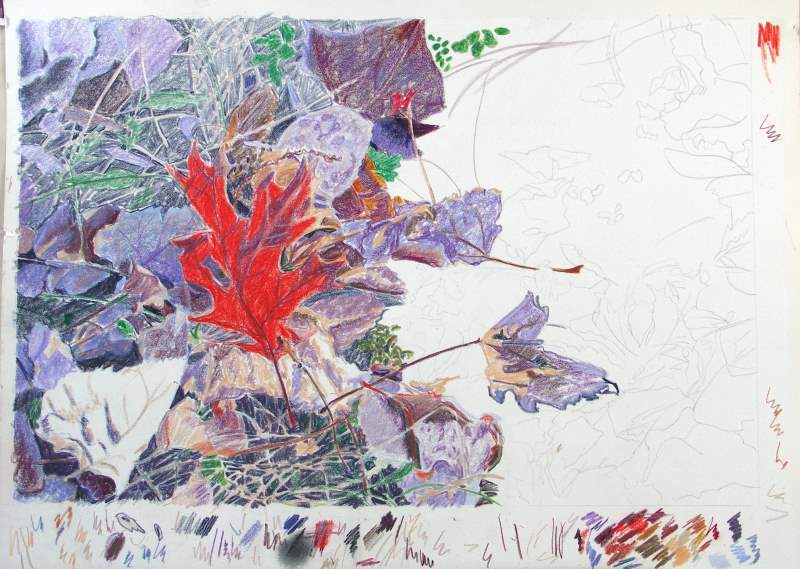 In progress, Red Oak Leaf, 12" x 18", colored pencil on grit primed paper. This drawing was a tryout for a set of 12 Creatacolor Soho Urban Artist colored pencils. I bought them on sale some time ago, put them away and just rediscovered them. I took a printout of a Tang pottery horse from my "do it someday" file and did a drawing on my homemade grit paper. The colors came out more brilliant than the dull colors in the source photo. Unglazed Tang Pottery Horse, 10" x 12", colored pencils on homemade grit primer applied to coldpressed watercolor paper.